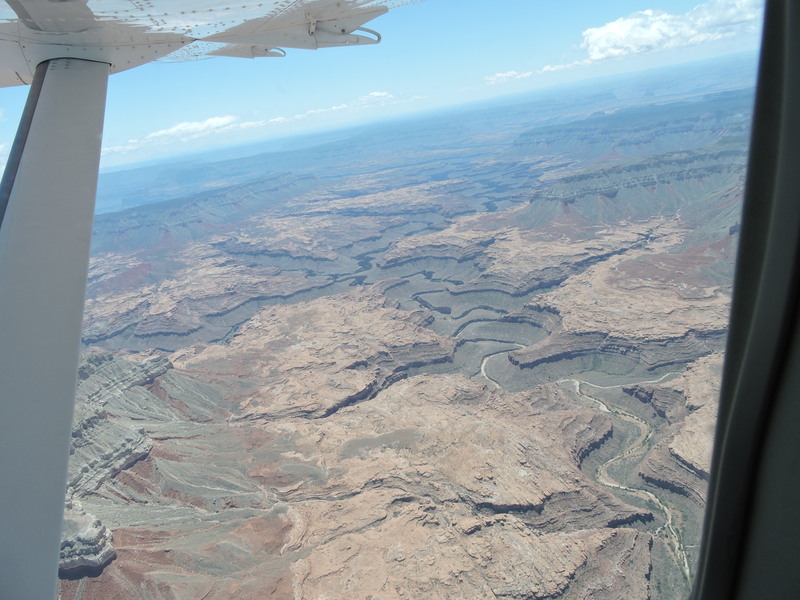 Don’t miss the view from the air at the end of your trip. It’s one of the coolest moments of rafting the Grand Canyon! In this Flashback Friday, Ted and Sowards discuss the flight out of the canyon and what it was like in 1984. Ted: This is a brochure… you know, the pilots that flew you out… that they sent. I don’t know if you want that. Do you remember those guys? E. Sowards: Yes, we could put something about them. E. Sowards: We were quite loaded. I thought after we got up over the rim I thought, "Now, we will be on level ground," you know. But we flew up and got across the canyon, and then he took us so we could see up this little canyon, and then that little canyon. It was funny though… while he was doing that the plane was very stable, but then when we got over the Kaibab Forest? Ted: Un-huh… that flat North Rim. Ted: They fly up there all the time, and they are the best pilots around. They stay in Boulder City, and fly up. I have worked with Earl for oh, twenty five years. He’s the kind of guy, you know, if you have an emergency… he can go in there with those planes right on the water and throw things out the window and put them right in the boat, almost. He can throw them so close that you can just reach over and get them. He will do that, if you need help and have an emergency. E. Sowards: Was he the older fellow? We met a younger fellow and an older fellow. Would he be the older one that we met? Ted: Yes. He’s a big, heavy guy. E. Sowards: Not extra tall, but does he have a tattoo? Ted: No. That was probably a different fellow. The owner of the company doesn’t always fly. He’s really a nice, friendly guy. E. Sowards: This was one of the young fellows that flew us. He said he was in his Jr. Year attending college. He was a nice fellow. Check back next week for more from Ted Hatch!